Lübeck is located in the state of Schleswig-Holstein in Germany. It is located on a penisula on the Lübeck Bay of the Baltic Sea. It’s location made it an extremely important harbour for trade and commerce. Historic town walls surrounded the city to protect it. These days you can still find remnants of these, one of these being the famous Holsten Gate. 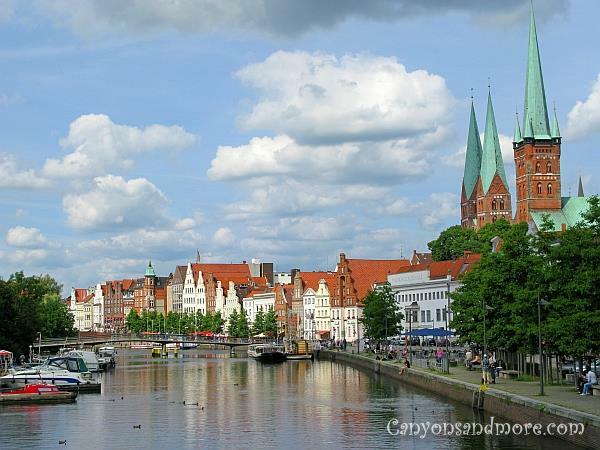 Today Lübeck is a lovely tourist attraction and is well known for its skyline of 7 steeples, the Holsten Gate and for its marzipan. It is also on the Unesco World Heritage List. Visiting Lübeck is really worth the trip in December. Here you can read about the Christmas Market in Lübeck. The image above shows Lübeck’s ideal location on the Trave River. That made it one of the most important and prosperous trading locations in medival times. There was even a time in the 13th century when it was the second largest city in Germany. 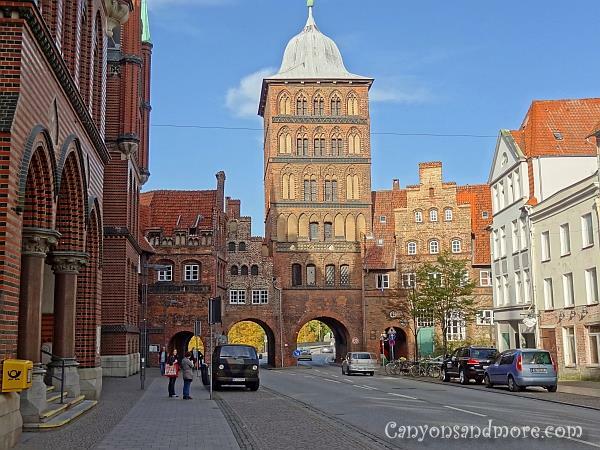 The Holsten Gate of Lübeck is probably the city’s most well known historical attraction. It’s unique structure attracts tourist from all over the world. Inside, you will find a museum displaying ancient weapons, armour and cultural items as well as information explaining the history of the city. 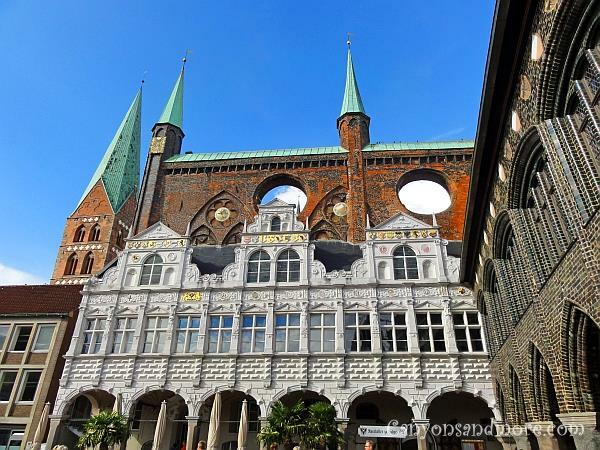 This is one side of the impressive looking town hall of Lübeck. During the year, the town hall square hosts weekly farmers markets and at Christmas it is the location of the Lübeck Christmas market. Imagine how nostalgic the market looks here. This is the other side of the town hall of Lübeck. This romantically colorful and carved balcony located at the town hall is an example of the beautiful architecture found all over this lovely city. It can be found on the main shopping street “Breite Strasse”. Niederegger is world famous for its marzipan and those visiting the city should not miss seeing this store, even if you do not like to eat marzipan. Niederegger is an attraction within itself. 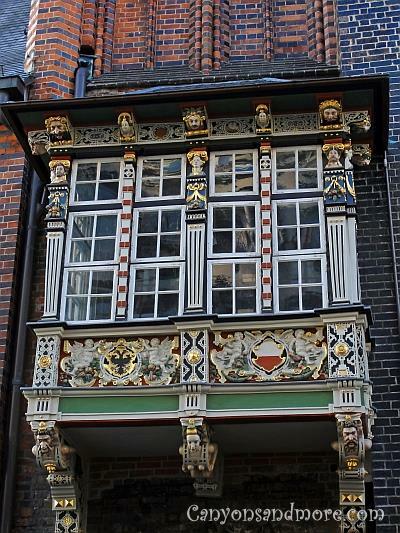 It is located on the “Breite Strasse” which is the main shopping street in Lübeck located in the pedestrian zone. On the first floor, you will find the store filled with marzipan and chocolates to please just about any sweet-tooth. During Christmas, it is even more special to see. The floor above is the cafe where you can get cake and coffee and tee. If you like marzipan, try out the marzipan coffee and marzipan tea. On the top floor is a small marzipan museum. It shows the history of marzipan with wonderful displays. Often someone will demonstrate how marzipan figures get made and you can then even purchase one if you like. This is an image made of the store window. The sign says that the display is showing the old city of Lübeck and the salt storage buildings of the 16th century. 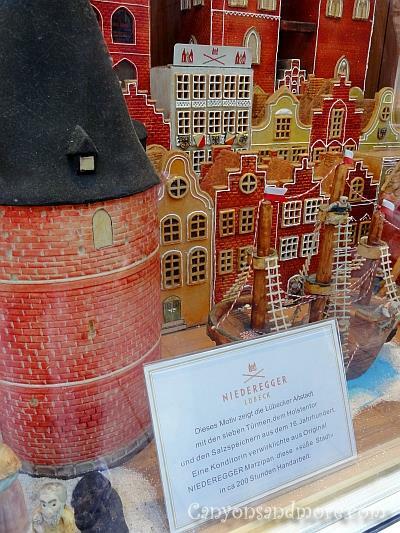 The display is created with original Niederegger marzipan and was handcrafted in 200 hours. 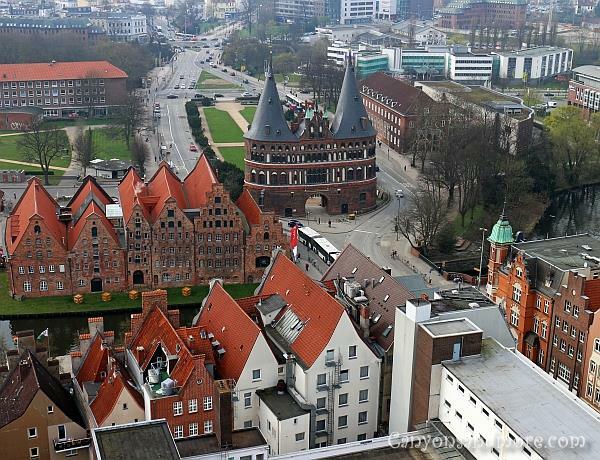 From the tower of the St. Petri Church, you can see over the rooftops of Lübeck. This is a view of the Holsten Gate and the ancient salt storage buildings. When at the top of the the tower of the St. Petri Church this is how the city hall market place and the St. Marien Church looks like. 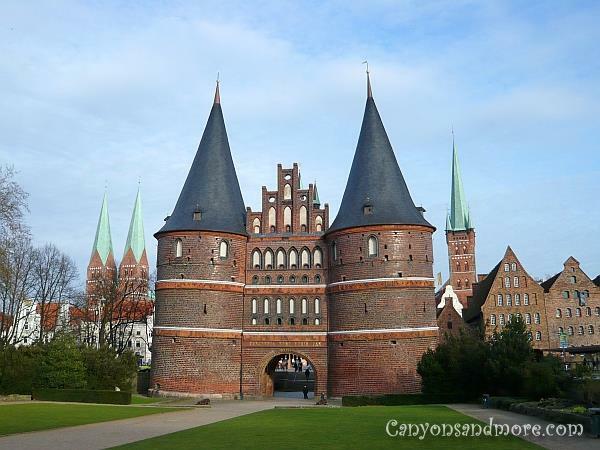 Lübeck used to have 4 city gates to protect the city in the past. Today only 2 of those gates remain. The first one being the famous Holsten Gate and the second one being this well maintained “Burgtor”. It is located on the north side of the city and was there to protect the city and its assets from invaders from outside. 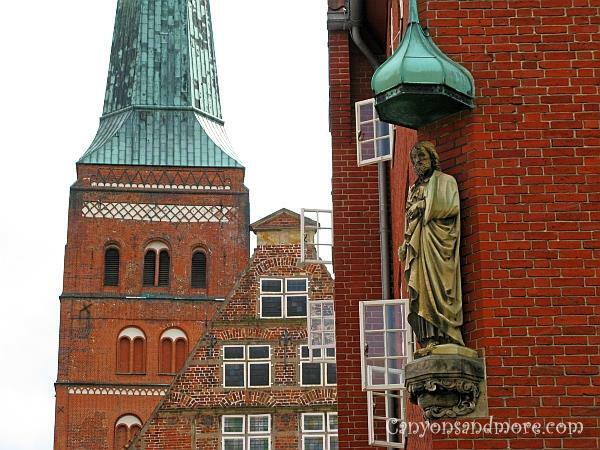 This is an image of Lübeck taken near the main cathedral of the city. It is always worth looking up while in this city. The architecture of the buildings and statues are located in many different places. Typical for this area is the red brick used for the buildings. That is common for the north German area. 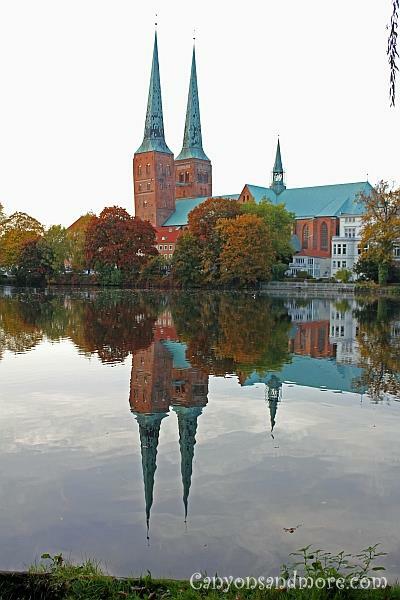 This image was taken on a fall day and shows the “Dom zu Lübeck” or the Lübeck Cathedral looking majestic over the pond “Mühlenteich”. 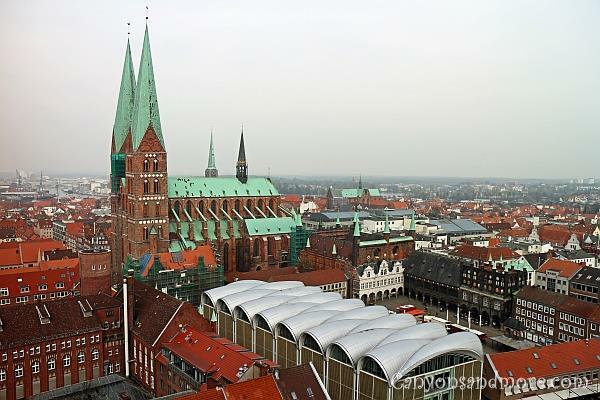 This cathedral is one of the many high spiring churches seen in the city skyline of Lübeck. It is located near the road “Fegefeuer” which means “Purgatory” when translated. A fitting name.